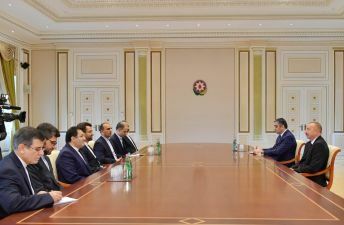 President of the Republic of Azerbaijan Ilham Aliyev has received a delegation led by Minister of Information and Communications Technology of the Islamic Republic of Iran Mohammad Javad Azari Jahromi. The head of state praised Mohammad Javad Azari Jahromi`s participation in Bakutel 2018, the 24th Azerbaijan International Telecommunications, Innovations and High Technologies Exhibition, as well as the fact that Iran is represented at the event by a large number of companies. President Ilham Aliyev noted Iranian companies` constant participation in the traditional exhibition. The head of state hailed good cooperation between Azerbaijan and Iran in a variety of areas, including in the fields of communications and information technologies. President Ilham Aliyev lauded regular reciprocal visits and contacts at the level of ministers. The head of state emphasized the creation of good opportunities for cooperation in ICT sector both at the bilateral and regional levels. Iranian Minister of Information and Communications Technology Mohammad Javad Azari Jahromi thanked for the reception. He noted that the two countries maintain good cooperation in the ICT field. He pointed out fruitful discussions aimed at expanding cooperation both at the bilateral level and also at the level of Iran, Azerbaijan, Turkey and Russia. Mohammad Javad Azari Jahromi hailed the fact that a lot of work has been done to expand cooperation and implement projects since the last year`s meeting with the Azerbaijani President. The sides also exchanged views over cooperation prospects.